The second reaction to the the law was more subtle and more general than the deliberate defiance of the smugglers and hoarders. Spurred by the tendency to want what they could no longer have, the majority of Miami consumers came to see phosphate cleaners as better products than before. 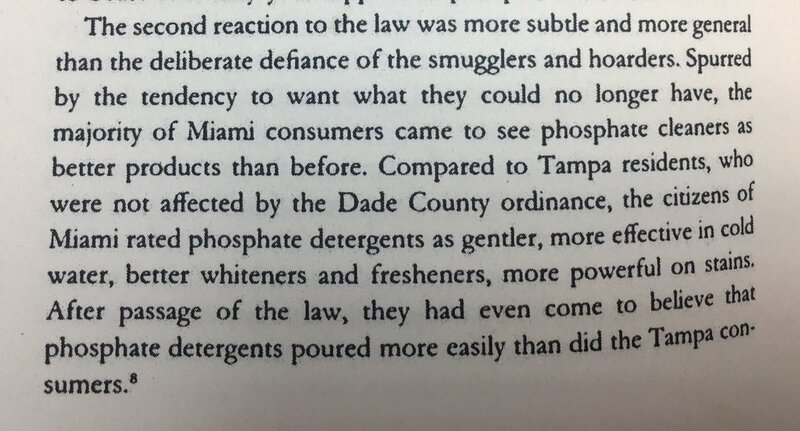 Compared to Tampa residents, who were not affected by the Dade County ordinance, the citizens of Miami rated phosphates detergents as gentler, more effective in cold water, better whiteners and fresheners, more powerful on stains. Affect passage of the law, they had even come to believe that phosphate detergents poured more easily than did the Tampa consumers.